During the recent Hurricane Matthew, we saw hundreds of thousands of sandbags being filled by hand. Filling bags by hand is labor intensive, slow and not very productive. Why would you fill sandbags by hand when an amazing sandbagging machine is available that can fill over 600 sandbags per hour? The SandMaster Sandbagging System allows for the quick filling and placing of sandbags. 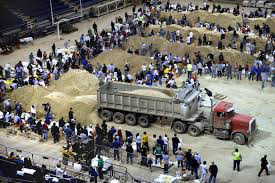 This reduces the time, labor and costs of sandbagging operations. 3-people can now do the work of 40, so sandbags can be produced in a fraction of the time with this Sandbagging System. 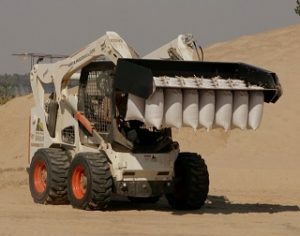 Quick to mobilize, easy to use and only requires a few people to operate is what makes the SandMaster the best choice for all sandbagging needs. The most efficient sandbagging machine on the market today is the SandMaster! Time is of the essence when sandbags are needed. The SandMaster Sandbagging System will help to provide the needed protection very quickly saving lives and property.